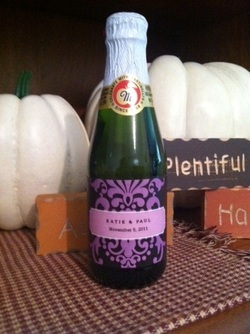 Reception Ideas - Katie & Paul's Big Day! We opted to forgo the traditional guest book. 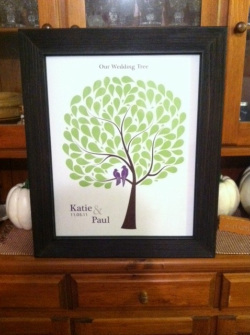 Since we are having a tree theme with our wedding, we are having a wedding tree guest book (purchased from Etsy). Each guest will sign their name on a leaf. After the wedding, we'll hang it in our hallway. This will be our cardbox at the reception. 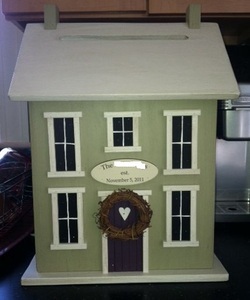 After the reception, it will be a birdhouse in our backyard. Again, it goes with our tree theme! It was purchased from Etsy. Here are our pony bottles of Martinelli's cider. I got them from TheKnot Shop. I'm pleased with how they came out and I hope our guests enjoy them!